Go from ordinary to extraordinary with our custom printed wall covering. Your space will be transformed to the exact look and feel that you would like in a way that has never been possible before. Showcase your company products in a stunning floor to ceiling mural. Easy to install or we'll do it for you! Our digital wallpaper can be hung like any commercial wallpaper using standard wallpaper paste. We also offer professional measuring and installation service in metro Atlanta. We’ll review your specs and formulate the exact number of rolls needed for your project. As part of our measuring and installation guarantee, we will replace or add paper at no extra charge if any is damaged during hanging or additional roles are needed. We make the entire process painless. Simply provide us with your room measurements, and let us know about any unusual elements that may affect hanging (such as shelving.) 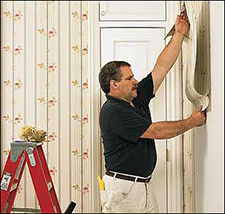 Our expert estimators will determine how many rolls are needed for your project and provide an estimate for the wallpaper and the installation. If you need your wallpaper installed for only a short period, such as during a promotion or seasonal event, consider our new repositionable wall covering. This unique wallpaper can be repositioned and reapplied multiple times. It features a self adhesive backing that uses no paste or water. Just peel and stick. This textured paper is four times thicker than standard wallpaper to hide wall imperfections and reduce glare. It is both tear and stretch resistant for easier application. We offer several wallpaper finishes and textures, so chances are we have one that is perfect for your application. Our wallpaper specialists will discuss your project and help suggest a wallpaper that is perfect for your application. Complete our short contact form to request a custom quote or call us at 404.745.9595 and a Wallpaper Specialist will be happy to provide additional information or quote your project.